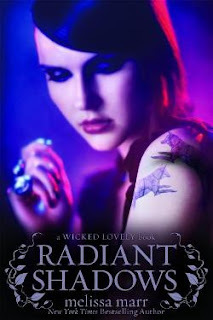 Radiant Shadows, the fourth novel in Marr’s Wicked Lovely series, tells the story of Ani. A Halfling. The daughter of Gabriel, assassin of the Dark Court. Friend of the former Dark King, Irial. Every day Ani is becoming more faery and less mortal than her Halfling siblings. As she changes so do her hungers and unlike all Halflings she has two she must sate. From being Dark Court, she must feel emotion and by being part Hound she must feel touch. Besides her father limiting her to feed, she rarely feeds knowing she could kill someone but taking both touch and emotions from one faery or mortal. The Dark Court continues to struggle and Ani just must be their salvation. When Ani’s life is threatened, she must decide whether to save her herself or betray those she loves. The Good: Melissa Marr has done it again. Radiant Shadows is another amazing addition to her series. Marr’s world-building skills are just extraordinary and I love the world of Huntsdale and Faerie. Ani, like the previous main characters, is a strong girl-power heroine. The development of Ani’s character was very connectible. I think we’ve all felt like we don’t belong anywhere. The romance in this novel is exquisite. Marr just has this magical touch to do intimate scenes with immense class. I absolutely love, as strange as it sounds, that her novels aren’t perfect. What I mean is, she’s not afraid to have cruel, evil, dangerous characters that cause horrible destruction. She’s also not afraid to show the scary, run-down parts of town that most novels avoid. Overall, her “imperfect” setting, characters, and endings make her novels realistic and enthralling. The Bad: After all that its very hard to say anything bad about Radiant Shadows. But about half-way through the novel and asked myself what had happened so far. I couldn’t really think of much. So I’m assuming I was consumed by the diverse vocabulary and great writing that the slow beginning didn’t bother me. Ugly Updates: The conclusion to the series, Darkest Mercy, comes out February 22nd. Melissa Marr constantly updates her website with contests, book news, and so much more.